When you’re on vacation, the last thing you want to worry about is lugging heavy coolers and chairs to the beach! Luckily, there are several places that offer Outer Banks golf cart rentals, so you can spend less time carrying equipment and more time relaxing by the shore. Read on to learn about the best golf cart rental services in the area. 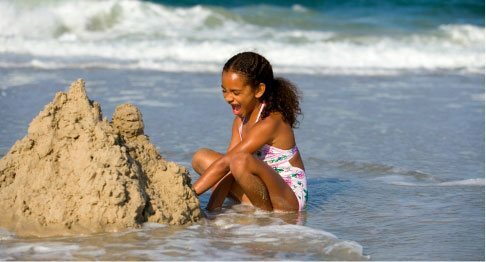 Then, be sure to request access to our free Vacation Guide for more tips about things to see and do in the Outer Banks! What could be better than having a golf cart delivered right to your doorstep? OBX Beach Buggies will do just that, bringing a fully charged vehicle directly to your vacation home. The best part? They never charge a delivery fee! In addition to golf carts, this rental agency leases LSV’s (Low-Speed Vehicles). The main difference between the two is that LSV’s are street legal on Route 12 and any NC public road with a speed limit under 35 mph. Standard carts may be driven to and from the beach along private roads in most neighborhoods. If you plan to rent through OBX Beach Buggies, make sure to take advantage of our special guest discount through Paramount Perks. You’ll receive an exclusive 10% discount on a 4-passenger LSV for a five-day (Mon. – Fri.), or a full seven-day rental. We highly recommend making a reservation before the busy summer season by ordering online or calling 252-715-1295. Whether you’re looking to rent a standard or LSV golf cart, Ocean Atlantic Rentals has a great selection of vehicles to choose from. Their rentals even include 4-person and 6-person “limo” carts that can easily accommodate the entire family. Each of their carts is equipped with seatbelts and lights, ensuring the ultimate in safety. Call 800-635-9559 or order online to reserve yours today! From VW bugs and OBX 4×4 rentals to 2-wheel drives and golf carts, Island Cruisers has it all! These Outer Banks golf cart rentals are available for pick-up from Hatteras Island and can seat anywhere between two and six passengers. While these golf carts are not street legal, it’s perfectly fine to drive them to the beach on private roads in most neighborhoods. To make a reservation, book online or call 252-987-2097. Located in Corolla, the golf carts at OBX Beach Toy Rentals are designed for efficiency and comfort. All of their four and six-person carts are eco-friendly electric and come equipped with a power cord so you can easily recharge between adventures. They also include headlights, taillights, seat belts, mirrors, canopies, cupholders, and folding back seats. OBX Beach Toy Rentals will deliver fully-charged golf carts right to your vacation home. They service many Corolla neighborhoods, including The Currituck Club. Give them a call at 252-597-3000 to inquire about their Outer Banks golf cart rentals. After an exciting day cruising around the barrier islands, cruise on home to one of our Outer Banks vacation rentals! We offer a wide array of homes in Corolla, Duck, Southern Shores, and The Currituck Club. Whether you’re envisioning an oceanfront retreat, an intimate condo, or a large family home with a private pool, we are sure to have the ideal property for your stay. We also offer dog-friendly rentals, like our Blue-Eyed Lookout! 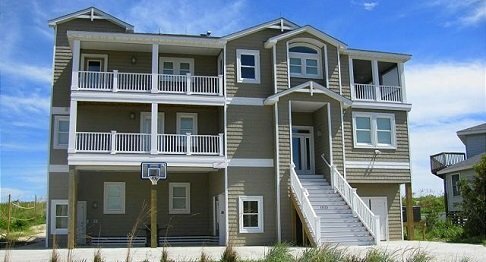 Many of our vacation homes are just a short walk or golf-cart-drive away from the best beaches, restaurants, shops, and attractions in the Outer Banks. If you have any questions about the area or beach equipment rentals, our staff is always happy to assist you! Make sure to check our current specials and book your stay with Paramount Destinations today. We look forward to seeing you soon! 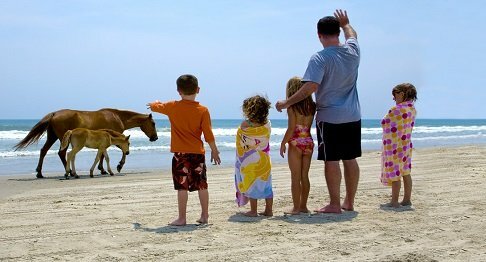 If you need more ideas to include in your OBX itinerary, be sure to check out our free Vacation Guide!